Providing you the best range of thermal imager, thermal imager testo-875i, thermal imager testo-890, one-hand ph / temperature measuring instrument, ph / temperature measuring instrument and pressure measuring instruments with effective & timely delivery. 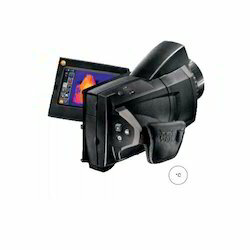 We are one of the leading wholesaler distributors & suppliers of Thermal Imager. 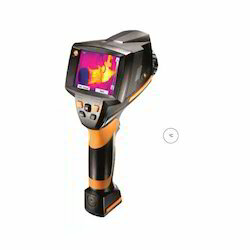 The thermal imager testo 875i quickly and reliably detects anomalies and weak spots in materials and components. Thanks to an imaging process, energy losses and cold bridges as well as damage or overheating in industrial systems are detected without contact. Whereas with other methods, cable or pipeline systems must be exposed over a large area, with the thermal imager testo 875, a single glance is enough. With the thermal imager testo 882, you test materials and components reliably and securely. The testo 882 – in ergonomic pistoldesign – stands out thanks to very highresolution thermal images and a high thermal sensitivity. This allows you to identify every detail on the measurement object completely non-intrusively, and detect anomalies and weak spots more easily even at a great distance. 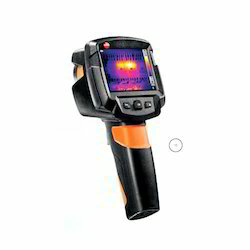 The thermal imager testo 885 is the professional measuring instrument for the high-precision detection of anomalies and damage to building shells or interiors. The high-quality infrared measurement system means that energy losses or thermal bridges in building shells can be reliably detected, enabling comprehensive energy consultations to be carried out. Indoor leaks can be reliably located, without needing to dismantle cable or pipeline systems. 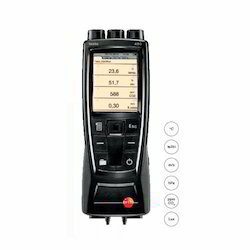 The intuitive testo 885 with its rotating handle, fold-out display and lots of helpful functions, such as panorama image assistant and autofocus, makes it is possible to carry out both quick on-site checks as well as comprehensive energy consultations with professional reports simply, reliably and professionally. 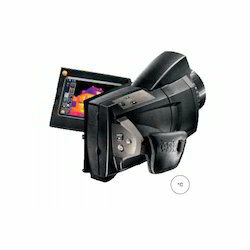 The thermal imager testo 890 offers outstanding image quality for the highest thermographic demands. Thanks to the high-quality infrared measurement system with a 640 x 480-pixel detector, thermal images can be recorded in megapixel quality (1290 x 960) using the SuperResolution technology. This means that even the smallest measurement objects such as electronic components or far distant measurement objects, e.g. on industrial plants, can be safely recorded thermographically in best image quality and high resolution. Even thermal processes can be precisely analyzed over time using the fully radiometric video measurement: all measurement points of the thermal image are available, accurate to the pixel, at all times. The instrument is especially well suited to pH measurements in semi-solid media such as meat. The storage cap filled with electrolyte gel is used for storing the probe between measurements. The testo 206 series is ideally suited for applications in liquid and semi-solid media. The instruments stand out thanks to the combination of a pH immersion probe and a temperature probe for precise and fast temperature compensation. Thanks to the large volume of gel electrolyte and the dual wall diaphragm, the probe is leak-proof, maintenance-free and insensitive to dirt. The automatic final value recognition supports the user during measurement. 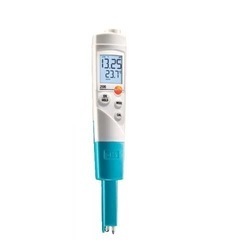 The protective cover TopSafe provides the instruments with the protection class IP68, it is dishwasher-safe, hygienic and protects the measuring instrument from dirt, water and impact. The testo 206-pH1 is specially designed for fast pH checks in liquids. The testo 206-pH2 is ideally suited for pH measurement in semi-solid and protein-rich foods such as jellies, creams, cheese, fruit etc. 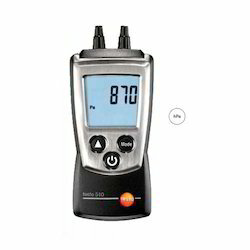 The testo 206-pH3 is equipped with a BNC socket which allows the connection of any pH probes to the instrument, depending on the application. This makes the instrument universally applicable. 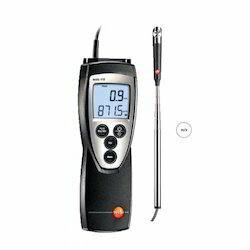 Testo 510 measures differential pressure in the range from 0 to 100 hPa. The differential pressure measurement is temperature-compensated for accurate measurement values. The measurement values can be displayed in Pascal over the entire measurement range. Magnets at the rear permit free-hand work. The backlit display allows the measurement values to be easily read out, even in unfavourable light conditions. The testo 510, in combination with a Pitot tube, measures air flow velocity. For accurate measurement values, the air density can be compensated. testo 510 is very handy, small and easy to operate. 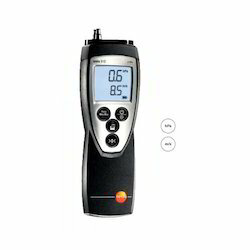 Testo 511 measures absolute pressure to an accuracy of ±3 hPa. The measuring instrument is ideal for absolute pressure compensation during flow velocity measurements with a Pitot tube, for example. By entering the altitude above sea level, this is converted into barometric air pressure. In addition to this, a barometric pressure measurement between two points is also possible. The eight switchable pressure units offer the user highest flexibility in measurement. The clip-on protective cap, wrist strap and belt holder ensure safekeeping of the instrument. 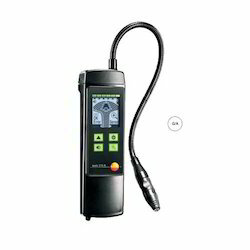 testo 511 is very handy, small and easy to use. The differential pressure measuring instrument testo 512 is available in four different versions: - Measuring range 0 to 2 hPa - Measuring range 0 to 20 hPa - Measuring range 0 to 200 hPa - Measuring range 0 to 2000 hPa (without flow velocity and Pascal measurement)testo 512 simultaneously shows pressure and flow velocity (apart from version 0 to 2000 hPa) in the large, easily legible, illuminated display, the measurement values can be printed out on site with date and time as well as minimum and maximum values.testo 512 has two switchable units for flow velocity, and for pressure, eight units can even be set. In the testo 512, damping for a sliding mean value calculation can be individually programmed, tightness compensation is integrated. The actual value displayed can be frozen in the display with the Hold-button, and the minimum and maximum values can be displayed and stored in the instrument. The TopSafe protects the instrument from impact, dirt and splash water in tough practical applications (optional). Battery Type 9 V, 1 pc. We are one of the leading wholesaler distributors & suppliers of Differential Pressure Measuring Instrument. 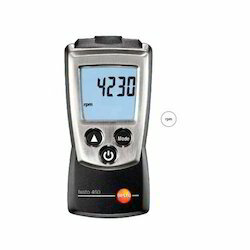 Testo 526-1/-2 is a highly precise differential pressure measurng instruemnt with an internal sensor. This has a measuring range from 0 to 2000 hPa. The instrument is optimally suited to pressure checks in sensitive industrial processes, and is available in 2 accuracy classes. 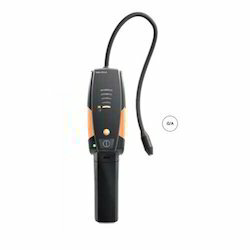 - testo 526-1: accuracy 0.1 % of final value - testo 526-2: accuracy 0.05 % of final value The testo 526-1/-2 additionally has two probe inputs for the connection of further probes for the measurement of pressure and temperature. A large selection of probes is available for this purpose. Specially for the purposes of tightness tests on containers, uninterrrupted recording is possible via the test menu in testo 526-1 and testo 526-2. The subsequent processing of the measurement data via software or printout via the printer allow the documentation of the pressure test. testo 316-3 is a reliable leakage detector for refrigerants which should be a part of every professional's refrigeration technology equipment. It detects even the smallest leaks thanks to its high level of sensitivity of 4 g/a, and fulfils the requirements of the F-gas regulation as well as the standards SAE J1627. The instrument is ready for use immediately after switching on, without the need for selecting a characteristic curve. Thanks to the automatic zeroing, the testo 316-3 detects leaks even in rooms which have already been contaminated. The testo 316-4 (Set 1) is a fast and reliable leakage detector for all common refrigerants. The sensor is permanently monitored and shows malfunctions or contamination in the display. The use of test leaks is thus superfluous. If dirty, the sensor can simply be cleaned, and is immediately ready for use again. The very high level of sensitivity of 3g/a according to EN 14624 allows the detection of the smallest leakages. The display changes from green to red when leaks occur. An audible signal additionally indicates detected leakages. With the earphone, testo 316 can also be used in loud surroundings. The trend display shows maximum leakages and facilitates the localization of leaks. The flexible gooseneck allows the optimum positioning of the sensor close to the pipe or other measurement site. For refrigeration systems which operate with ammonia, there is the testo 316-4 (Set 2) specially for ammonia, or the replacement ammonia head (NH3) for the testo 316-4 (Set 1). 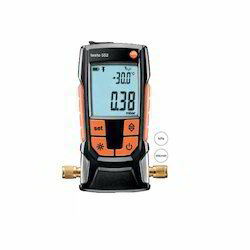 Testo 550 is the robust tool for daily use on refrigeration systems and heat pumps. The robust 2-way metal valve block with 3 connections and 3 hose holders allows fast and easy work. The solid housing reliably protects the testo 550 from knocks. During measurement, the suspension hook guarantees secure attachment of the digital manifold. The vacuum display informs of the vacuum reached during evacuation. 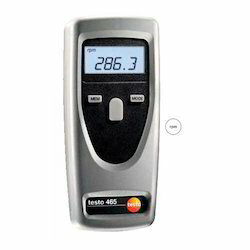 This makes the testo 550 excellent for service, maintenance and commissioning tasks. Thanks to further instrument functions such as the automatic heat pump mode, which makes switching over the refrigerant hoses superfluous, and the temperature compensated tightness test function, work on refrigeration systems and heat pumps is easier than ever. The testo 552 is a digital vacuum measuring instrument for the evacuation of refrigeration systems and heat pumps. It measures even the smallest absolute pressures and provides highly precise information on the status of the dehumidification of a system (removal of foreign substances, incl. oils or foreign gases).The testo 552 is the only digital vacuum measuring instrument whose absolute pressure sensor, in contrast to other sensor technologies, no longer needs to be serviced, and still provides highly accurate measurement results. Thanks to the battery life of up to 2400 hours with two conventional AA batteries, you can use the testo 552 in continuous operation for 100 days without changing the battery. Its robust construction makes it suitable for daily use, and protects from dirt and water. 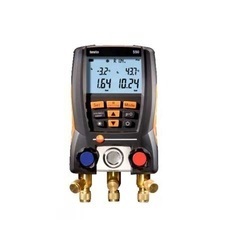 The digital manifold testo 557 is a robust tool for all measurements on a refrigeration system or a heat pump. The manifold disposes of a robust 4-way metal valve block with additional connection options, for example for a vacuum pump or refrigerant bottle. This provides a definite advantage in the handling and enables fast and efficient service, maintenance and commissioning. The solid housing reliably protects the testo 557 against any strain in everyday work. The integrated vacuum measurement enables reliable measurement results when evacuating refrigeration systems and heat pumps. Especially the automatic heat pump mode, which makes switching over the refrigerant hoses superfluous, the temperature-compensated tightness test function and the automatic ambient pressure compensation, make the work more safe, efficient and precise than ever before. 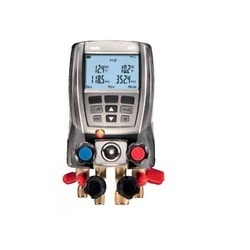 The digital manifold testo 570 is a robust tool for all imaginable measurements on a refrigeration system or heat pump. The instrument is capable of considerably more than just measurement. Pressures, temperatures, vacuum or current – testo 570 analyses them all. It stores all measurement data, right from commissioning, to service and maintenance, through to the error analysis of a system. The internal data memory replaces manual work steps. This means that, for example, long-term measurements can be carried out, or data can be recorded in real time and presented graphically. Errors can be found and rectified more quickly in cases of malfunction. Manual documentation is also a thing of the past. Measurement protocols can be produced on site and results traced at any time. This ensures transparency and inspires trust in the customer. The especially handy, pocket-sized rpm measuring instrument testo 460 optically measures rpm, e.g. on ventilators and shafts. The ideal distance to the measurement object is between 10 and 40 cm. Simply attach a reflective marker (optional) to the measurement object, point the visible measurement spot at the reflective marker, and measure. Min./max. values are directly displayed at the press of a button. 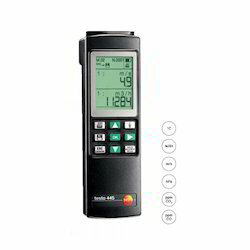 The Hold-button allows particularly convenient reading of the measurement values. The illuminated display enables easy read-out of the measurement values even in bad lighting. testo 460 is very small, handy and easy to operate. The clip-on protectiove cap, wrist strap and a belt holder provide safe storage, ensuring an especially long working life. 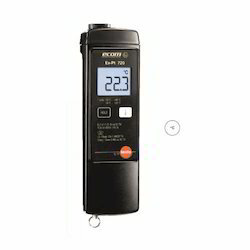 With the testo 465, you can measure rpm easily without contact using only one hand. The measuring instrument is thus suitable for measurements on rotating parts such as ventilators and shafts. Simply attach a reflective marker (optional) to the measurement object, point the visible red beam of light at the reflective marker, and measure. The distance to the measurement object is up to 600 mm. The measuring instrument stores mean, min. and max. values as well as the last measurement value. The SoftCase included in delivery protects the instrument from impact, ensuring an especially long working life. The rpm measuring instrument testo 470, which can be operated with one hand, offers an optimum combination of optical and mechanical rpm measurerment. By simply attaching an adapter for a probe tip or a speed disc, the optical measurement becomes a mechanical one. This allows speeds and lengths to be measured additionally. For optical measurements, simply attach a reflective marker (optional) to the measurement object, point the visible measurement spot at the reflective marker, and measure. The distance to the measurement object is up to 600 mm. The testo 470 stores mean, min. and max. values as well as the last measurement value. The SoftCase included in delivery protects the instrument from impact, ensuring an especially long working life. The high light-intensity hand stroboscope testo 476 is used when it is necessary to make fast-moving objects appear in slow motion. The hand stroboscope Pocket Strobe™ measures and tests rotation and vibration movements. It allows the measurement of very small objects, or in places which are not directly accessible – and it does this without interrupting the production process! The testo 476 is thus optimally suitable for rpm measurements and for the inspection of components moving at high frequencies. The energy-optimized switching electronics and the lightintensive xenon flash lamp provide a high light intensity (approx. 800 Lux). 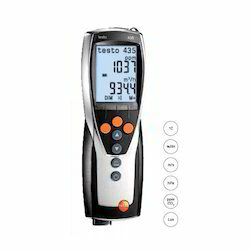 testo 476 has a memory function which stores the last measurement value when the instrument is switched off. For long-term inspections of measurement objects, a trigger input is available. The high-performance battery pack allows a continuous operating time of at least 2 hours over the entire frequency range. The testo 477 LED hand stroboscope is used when it is necessary to make fast-moving objects appear in slow motion. testo 477 visualizes rotation and vibration movements and allows measurement during continuing operation. The static image allows the inspection and qualitative evaluation of components moving at high frequencies. Thanks to the trigger input and output, the testo 477 can be connected to external systems and controlled by an external sensor. The impact protection on the testo 477 and the protection class IP65 additionally guarantee that the instrument can be used under tough conditions. The long battery life enables you to carry out measurements for up to five hours. 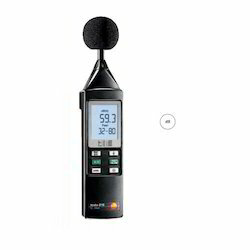 The testo 815 is the ideal instrument for the evaluation of sound level in everyday work. The instrument can be used for monitoring measurements in the areas of air conditioning or heating, on combustion plants or at workplaces, however machine or discotheque noise can also be evaluated quickly and precisely. Using the Fast/slow button, the measurement time can be set from 1 s to 125 ms, in order to better evalaute the noise source. The frequency analysis can also be switched from characterisitc curve A to C.
The characteristic curve A corresponds to the sound pressure perception of the human ear, whereas characteristic curve C can also evaluate the low-frequency components of a sound. With the help of the optional calibrator, the measuring instrument can be recalibrated directly on site with the screwdriver provided. The wind protection cap included in delivery ensures correct measurement results when measuring outdoors, and if required can protect the microphone from dirt and dust. 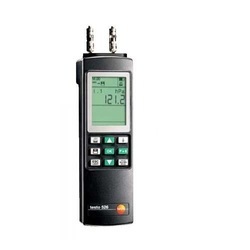 The testo 816-1 is ideal for sound level measurements at workplaces, in industrial and production halls, and in public places. 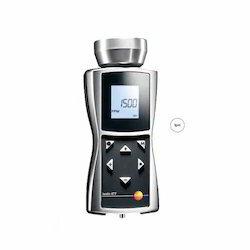 With the touch of a button, the measuring instrument can be switched from Slow (1 sec.) to Fast (125 ms). It is also possible to switch between the frequency weighting characteristic curves A and C and vice versa, also at the touch of a button. Characteristic curve A corresponds to the sound pressure sensitivity of the human ear, while characteristic curve C can evaluate low-frequency components of a noise. The integrated data store allows the storage of over 30000 measurement values in the instrument, these can be administered using the software included in delivery. In addition to this, the software allows online measurements over a longer period to be carried out. 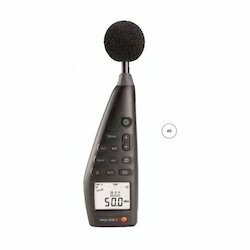 With the optional sound calibrator and the adjustment accessory included with it, the testo 816-1 can be re-calibrated on site. Bad air quality in indoor rooms due to excessively high CO2 concentrations (greater than 1000 ppm) leads to tiredness, lack of concentration and can even cause illness. testo 535 is a precise, reliable CO2 measuring instrument for monitoring Indoor Air Quality. The high-quality and stable 2-channel infrared sensor allows long-term measurements, and does not require repeated adjustment. With the switchable display of min./max. and mean values, the customer has an optimum overview of the measurement results. The measurement data can be documented on site incl. date and time with the Testo fast printer. The optional TopSafe provides optimum protection of the instrument from dust, dirt and impact. 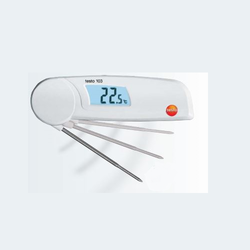 At a length of 11 cm, the testo 103 is the smallest folding thermometer in its class. It hardly takes up any space, so you can simply stow it in your breast or trouser pocket. That way, it is always quickly available and close to hand. The small folding thermometer is immediately ready to measure after folding out to an angle of greater than 30°, and is therefore flexible in its application. After measurement, the probe can simply be folded away and stored safely until the next measurement. The mini and surface thermometers fit into any jacket pocket. They are small, convenient and always ready for use anywhere: whether in the food sector, the pharmaceutical industry or in the heating and ventilationbusiness. 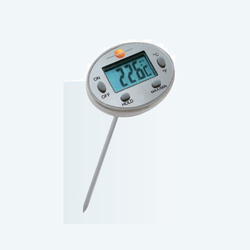 The great advantage is that the mini thermometers record temeprature in the air as well as in soft or powdery substances and in liquids. The affordable testo mini thermometer with alarm function is small and handy, but big on performance. The penetration probe has an 80 cm wire and is permanently fixed to the instrument. The probe and the wire can be easily and compactly stored in the instrument. If individually settable limit values are violated, an audible signal is sounded. The minimum penetration depth of the probe tip should be 20 mm. 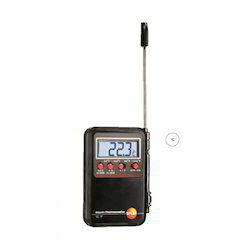 The alarm thermometer is suitable for the recording of temperature in the air, in soft, powdery substances and in liquids. It is not suitable for use in ovens or fermentation cabinets. All HVAC measurement parameters The multi-function measuring instrument testo 435 is your reliable partner for analyzing Indoor Air Quality. Indoor Air Quality has a crucial influence on the well-being of humans at their workplaces, and is also a determining and important factor in storage and production processes. In addition to this, the Indoor Air Quality signals whether the HVAC system is working at optimum energy level, or needs to be adjusted using the testo 435. The parameters CO2, relative humidity and room temperature are available for the evaluation of Indoor Air Quality. In addition to this, absolute pressure, draught, Lux, U-value and surface temperature can be measured. For thedetermination of volume flow, you can use all possiblities for the measurement of flow velocity – such as thermal probes, vanes and Pitot tubes. 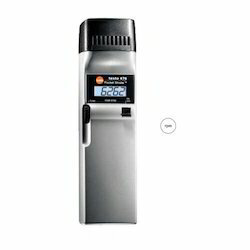 The right instrument for every application The new testo 435 is available in four versions. Depending on the application, you can choose from versions with builtin differential pressure measurement as well as versions with additional instrument functions such as instrument memory, PC software and an extended range of probes. Ex-Pt 720 is a highly accurate measuring instrument for fast and exact temperature measurements in areas with danger of explosion up to Zone 0. The large measuring range and the precise four-wire technology make the Ex-Pt 720 the ideal measuring instrument for monitoring measurements. The instrument is authorized according to European as well as US norms. A broad probe range already covers most applications, on request you can obtain your own customized probe at short notice. The carrying strap and the simple and easy-to-read large display provide additional security on site. 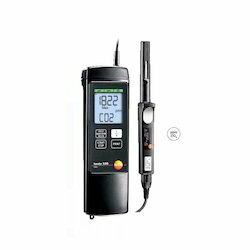 Testo 405 is a thermal anemometer. 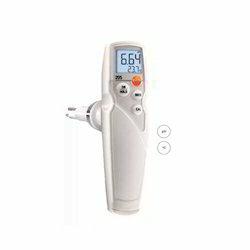 It allows the precise measurement of air flow velocity, volume flow and temperature. With the extendable telescope (up to 300 mm), testo 405 is particularly suited for measuring the flow velocity in ducts. Thanks to the attachment included in delivery, the telescope can be optimally positioned in a duct. 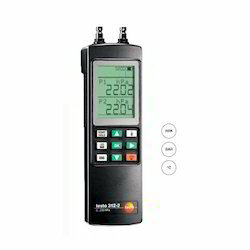 The testo 405 measures especially accurately in the range from 0 and 2 m/s. Low air flow velocities such as at draughty windows, for example, can thus be localized exactly and measured extremely accurately. The display can be rotated into different positions. This enables optimum readout of the measurement values. Testo 480 supports assessors, consultants, technical service providers or service technicians in the ventilation and air conditioning field. Measurement tasks such as the standardized adjustment of VAC systems in office, residential and industrial buildings can be carried out quickly and efficiently. 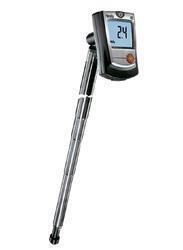 The VAC measuring instrument is equipped with intelligent digital probes with integrated memories. The probes inform the instrument as soon as the next calibration is due. The calibration data are entered via the software and are then permanently stored in the probe. This compensates deviations automatically, producing a zero-error display. The possibility of having the probes calibrated without the hand instrument ensures the uninterrupted use of the instrument. With the testo 480, professionals can detect negative environmental influences such as draughts, ensuring a climate of well-being, for example in open-plan offices, and sustainably reducing costs. 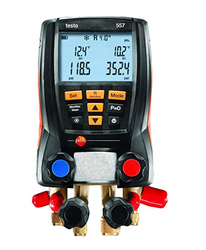 This service instrument is s real multi-talent: the testo 445 has two probe inputs for the connection of a broad range of probes for measurements on ventilation/air conditioning systems. The instrument records flow velocity values in a duct, at a duct outlet or on extraction systems. 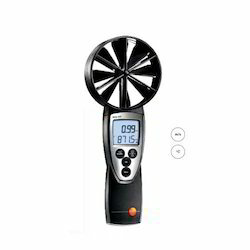 In addition to this, the allrounder measures or calculates the parameters volume flow, Indoor Air Quality, temperature, relative humidity, dewpoint, absolute humidity, degree of humidity, enthalpy, pressure and CO.
We are one of the leading wholesaler distributors & suppliers of Vane Anemometer. 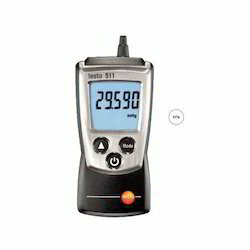 The testo 416 is a compact anemometer with a fixed vane probe. The measuring instrument is particularly suitable for flow velocity measurements in ducts thanks to the extendable telescope (max. length 890 mm, diameter 16 mm). The volume flow is directly shown in the display. For volume flow calculation purposes, the duct crosssection area can be conveniently entered into the testo 416. The timed and point mean value calculations provide information on the average volume flow. The Hold function allows the current measurement value to be fixed in the display. Min./max. values are also displayed at the press of a button. The optional TopSafe reliably protects the instrument from dirt and impact, ensuring a particularly long working life. The testo 816 is the ideal sound level measuring instrument for assessors, workplace measurements and for the measurement of industrial and environmental noise. Using the Fast/Slow button, the measurement time can be set from 1 s to 125 ms, in order to better evalaute the noise source. The frequency analysis can also be switched from characterisitc curve A to C. The characteristic curve A corresponds to the sound pressure perception of the human ear, whereas characteristic curve C can also evaluate the low-frequency components of a sound. 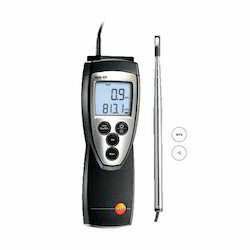 The testo 816 also has an AC and DC output. Via the AC output, recorders or amplifiers can be connected directly to the instrument, and via the DC output, graphical recordersor data loggers can be used easily and directly on site. The analog bar graph display offers the user a fast overview over the complete measuring range. With the help of the optional calibrator, the measuring instrument can be recalibrated directly on site with the screwdriver provided. 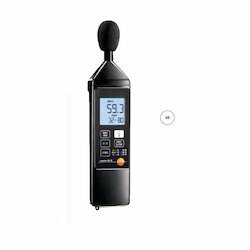 The wind protection cap included in delivery ensures correct measurement results when measuring outdoors, and if required can protect the microphone from dirt and dust. Testo 425 is a compact anamometer with a fixed thermal flow velocity probe. The probe head has a diameter of 7.5 mm. With the extendable telescope (length max. 820 mm), the measuring instrument is suitable for flow velocity measurement in ducts. 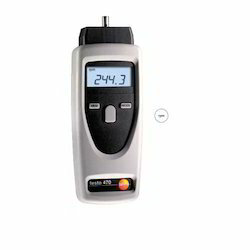 The testo 425 also measures extremely accurately in the low flow velocity range. The volume flow is directly shown in the display. For the purposes of volume flow calculation, the duct area can be easily entered into the testo 425. In addition to this, the instrument can be switched over to display the current temperature. Timed and point mean value calculation provide information on the average volume flow, flow velocity and temperature measurement value. The Hold function allows the current measurement value to be frozen in the display, min./max. values are also displayed at the press of a button. 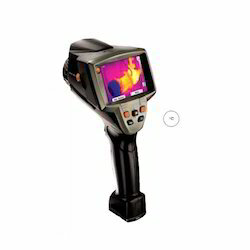 Looking for Thermal Imagers ?